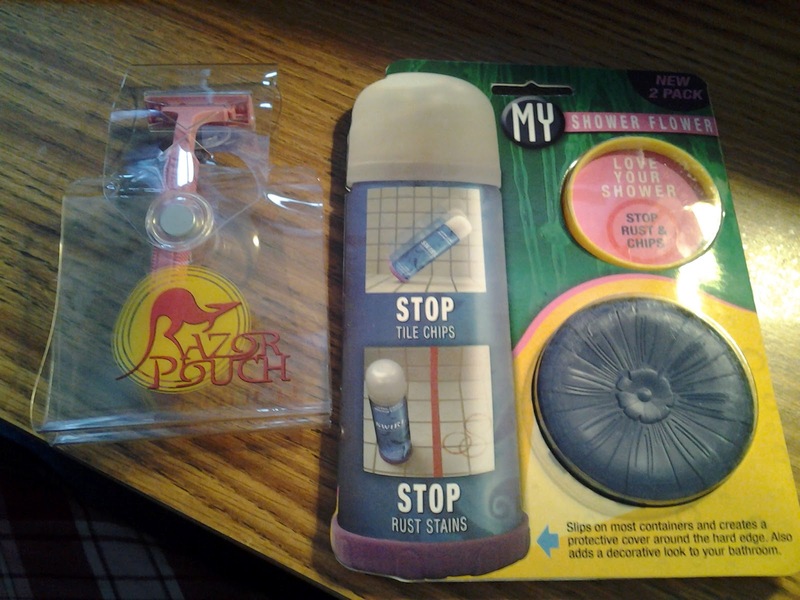 Razor Pouch : Founded in 2009, Razorpouch has been providing men women and children with affordable products that make life easier and more organized in the bathroom and shower space. Products such as Razorpouch, Showerflower, and Toothbrush pouch have helped transform the bathroom into clutter free areas. We believe in giving customers affordable, easy storage solutions! 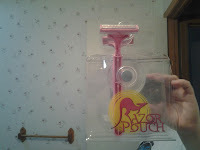 When I added Razor Pouch on twitter I had no idea they would message me and ask me to do a review! I couldn't turn them down knowing they had amazing products that I had already wanted to try more than anything! So I was super excited to try them, was I let down? Not at all! If anything I fell in love with the products even more! They sent me 2 products to try. 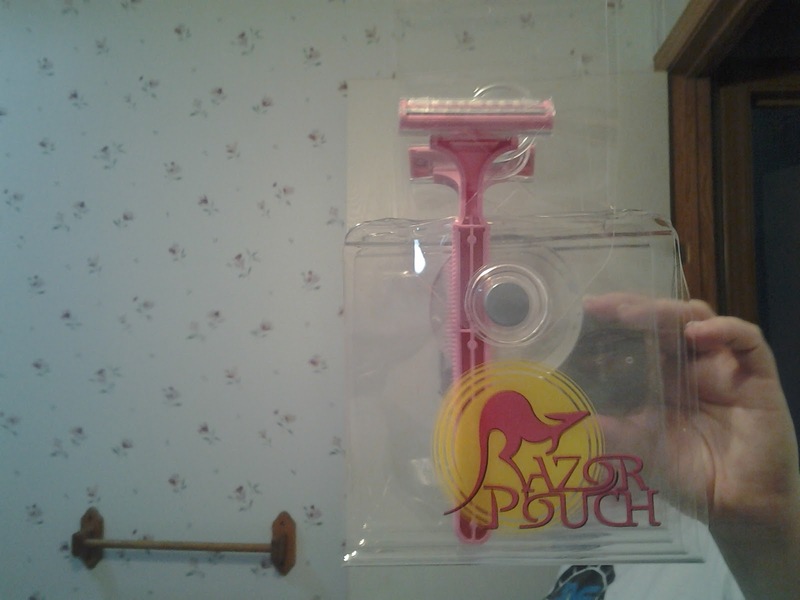 The Razor Pouch, and the Shower Flower. I had seen these products on previous review blogs and they had nothing but great things to say about them. I want to start out with the (2) pack Shower flower. They has saved me from tons of tub cleaning! before the shower flower, My shaving cream cans (which are supposed to be rust proof, Ha!) used to leave these horrid, horrid stained rings on the tub. We don't have a ceramic or tiled tub, we have a older plastic tub (previous owners) and the tub collects and absorbs every stain, shows every scratch, and keeps every dent there has ever been. If I don't scrub down anything that shows on the tub it stains where I have to scrub it down with Ajax and a scrub brush until my hands are raw. But since the shower flower I have had not even 1 rust stain from neither my husbands shaving cream cans nor mine. Hooray! It's less work on me having to scrub stains off the tub. and it gives a pretty twist to the cans with it's chic' bright colors. 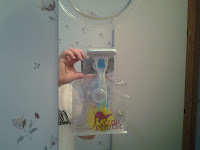 The Razor Pouch is one of my favorite new bathroom acessories! let's face it, we all shave. Men, women, and teens. Men shave their faces, and sometimes other body parts, Women shave their legs, arm pits, and some other areas of the body, it's nice to finally have an accessory for our razors! before the razor pouch I would lose my razors, they would break, the blades would bend, or I would cut myself trying to access my razors. With the razor pouch I can easily access my razor without cutting myself, I know exactly where my razor is at all times, the Razor Pouch is made of a thick clear vinal so it won't tear, and will last forever. 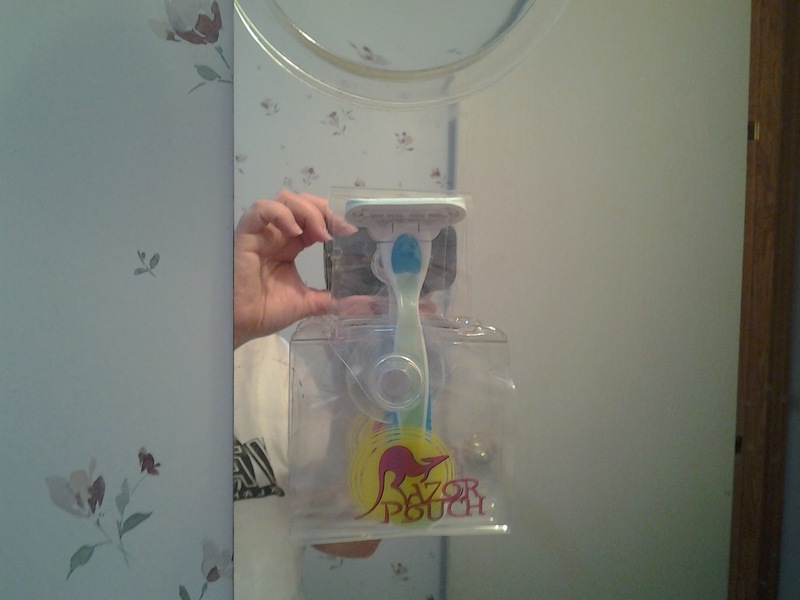 it protects my razors like a pro. ♥ I receive no monetary compensation for this review. I was provided a Razor Pouch to try and give my honest opinion.